Sponsored and branded legal briefs: Appealing or appalling? If you’re a regular reader, you know that I’ve often griped about 21st century advancements like attorney bidding sites or listing sites not because I’m trying to defend lawyers’ turf, but rather, because I’m skeptical as to whether these sites really expand access to law in a meaningful way. As I’ve written here, many of these sites tackle low hanging fruit – like helping clients locate lawyers online or driving down lawyers’ fees – but they don’t address many of the other costs that drive the price of legal services such as inefficient courts that persist in requiring multiple paper copies even when they’ve transitioned to e-filing and pricey transcripts (as much as $5-$8/page) needed for depositions or appeals. 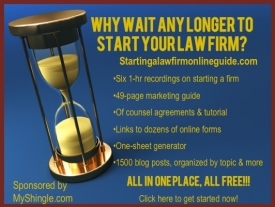 As a lawyer who frequently handles appeals before federal circuit courts, it’s discouraging for me to tell clients that they may have to shell out anywhere from two to four thousand dollars simply to cover the cost of preparing eight bound copies of an initial and reply brief, along with eight copies of joint appendix that depending on the size of the record, could amount to 1500-2000 pages. These out-of-pocket costs alone are often scary enough to deter clients from even thinking about appeals — which is unfortunate since in many situations, the legal work itself isn’t all that complicated either because the appeal can be limited to a discrete issue or because many of the issues were already thoroughly researched and argued in the proceedings below. In fact, I’d guess that many lawyers – myself included – might be willing to take on an appeal that involves a juicy issue on a partial contingency or even pro bono basis so long as we weren’t on the hook for the rather considerable out of pocket costs as well. So I got to thinking – what if lawyers could subsidize the out of pocket cost of briefs and even the legal fees with paid advertising from sponsors who support the clients’ cause? With legal briefs now widely posted online by lawyers at numerous courts and agencies (where they are often linked to by the press or bloggers)not to mention more social sites like JD Supra, a sponsor could at once generate good visibility online and good will from its customers. I know it sounds crazy (even my ordinarily taciturn husband derided the concept cheesy), but let me make my case to the court of public opinion. First – would there be a market for sponsorship of briefs? I think so. Many briefs at the appellate and Supreme Court level deal with broad policy issues – privacy, data protection, copyright , defamation in an internet age and more – that are important to companies and their customers. Sponsorship would give companies an opportunity to show that they support a particular position. Likewise, cases involving zoning issues or eminent domain or local curfews or tax laws may not capture national attention, but matter within a community – thus making the briefs of interest to local businesses. And while many times companies do weigh in on these issues by filing amicus briefs, it’s far less expensive to sponsor a brief than to go through the trouble of preparing one. To locate a sponsor, lawyers could contact a company on their own. Alternatively, it wouldn’t be that difficult to set up a Kickstarter kind of site where lawyers could post a description of the issues on appeal or a video pitch along with samples of their work product to attract potential sponsors. Sponsorships wouldn’t be limited to corporations either; individual citizens who feel strongly about a cause could chip in in exchange for an acknowledgement somewhere in the brief. To avoid any outside influence, sponsors would be required to accept the final brief as is without any control over the content. As for drawbacks to brief sponsorship, first, I’m not proposing that sponsors be afforded free reign to plaster the front or back cover of a brief with blazing ads depicting lawyers as pitfalls or implore readers to call 1-800-WEBULLY. Even if lawyers didn’t have restraint, courts have strict requirements on what can be included on the front or back cover of briefs and those rules alone would preclude brazen or distracting ads. Instead, a company might include a tasteful logo below the lawyer’s name on the cover or the signature line on the back, with a URL to its website and a brief note identifying the company as the sponsor. Second, client consent to sponsorship is imperative; a lawyer would be prohibited from slapping an ad on the brief without the client’s agreement. Moreover, the lawyer would need to assess potential sponsors and determine whether allowing a company to sponsor the brief could prejudice the client – perhaps not so much before the court, but in the court of public opinion (consider, for example, if a gun company wanted to sponsor a brief in an appeal of a murder conviction where a spouse used that particular gun to shoot her ex). Perhaps the idea of sponsoring appellate briefs is unseemly. But it would provide a source of revenue to make appeals — which are one area of practice that are not as conducive to form or automation — more accessible. Is that really so unappealing? Let me know your thoughts below.